Over 40 girls and women enjoyed playing cricket for Henley CC in 2015 which is a long way from the 2 or 3 girls we started with in 2012! We are proud to have become one of the leading clubs in Berkshire for Women and Girls Cricket. We hope our growing numbers speak volumes about the fun and enjoyment our girls and women have playing at Henley, whether they are aiming to play at county level or just want a fun way to keep fit while playing a team game in a warm and friendly environment. We are an inclusive club who believe that every girl or woman who wants to play in matches should be given the opportunity to do so. 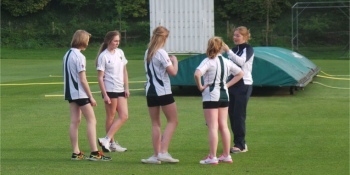 Our junior girls participate in the Berkshire Youth Cricket League, Lady Taverners National Competitions and play a number of friendlies throughout the season. Junior ages range from 7 to 15 and we enter teams in U11, U12, U13 and U15 competitions. We kicked off our 2015 season in style with a special coaching session from England Legend Mathew Hoggard. The girls were clearly inspired and a fantastic season followed. 2015 saw Henley host the U12 county Finals where our U12 girls were crowned county champions. Elsewhere our U15’s became county runners up and our U11’s were Royal London Gilbert Cup winners at the Ageas Bowl. We are extremely fortunate to have a fantastic coaching team led by ECB qualified coaches. We ensure the ratio of players to coaches is appropriate so that everyone gets the most out of their sessions. The more players we have, the more matches we can play! We actively encourage all new girls and women to come along and try a session or two, from complete beginners to experienced county players. No equipment is necessary as we can provide everything you need. If you’d like more information on how things work please drop us a line or give us a call. You can find telephone numbers and e-mails below.